The federal debt has been one of the most divisive issues in Congress, leading to cuts in public welfare, near default on our debts, and a sequester agreement which has hurt almost every segment of our economy. Yet, we have not adequately addressed two of the largest expenses, which could be reduced without sacrificing our security or our safety net programs. The graph below reports the way our country spends its money. Interest on the public debt is one of our largest expenses and one that could easily be addressed. That could be addressed by restoring a progressive tax rate, by cutting tax loopholes, and by removing subsidies to profitable industries and the wealthy. Congress cannot seem to act on raising taxes as many of the Legislators have signed on to Grover Norquist’s pledge not to raise taxes. Senator Tom Coburn, in his Back in Black report , has identified many of the porkbarrel programs that could be cut if Congress had the will to do so. The military–industrial complex refers to the policy and monetary relationships which exist between legislators, the armed forces, military contractors, and the military industrial base that supports them. These relationships include political contributions, political approval of military spending, and lobbying to support military bureaucracies and weaken oversight of the industry. We have not followed Ike’s advice, as we have allowed the military-industrial complex, in the name of providing security, to gobble up a large share of our national spending. We need to shift our resources to intelligence and diplomacy to combat terrorism, and away from the much more expensive, and much less necessary, conventional military spending. This entry was posted on Friday, March 21st, 2014 at 9:46 am	and is filed under National Politics. You can follow any responses to this entry through the RSS 2.0 feed. You can leave a response, or trackback from your own site. 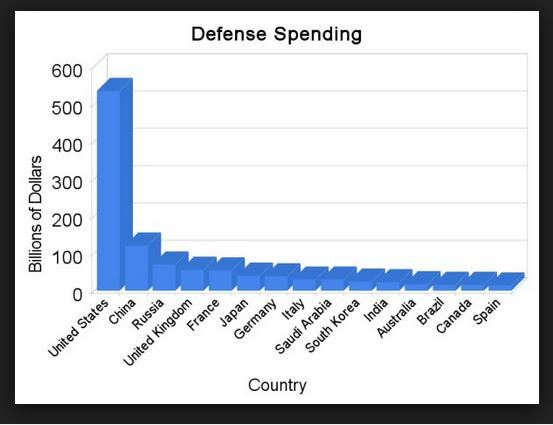 I’m shocked by how much the US spends on the military. I wonder where New Zealand would fit on that graph? Probably even lower than Spain I imagine. 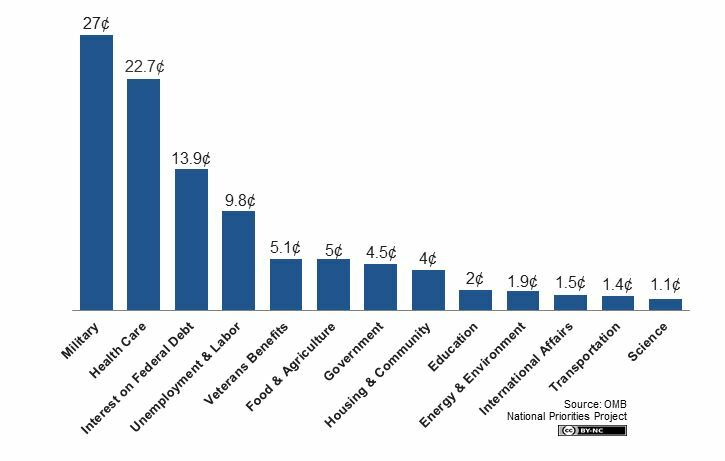 It is not only shocking how much the US spends, but it is quite unnecessary to spend that much. In 2012, New Zealand spent $1,867,000,000, 1.1% of its GDP and 61st in military spending. You apparently don’t have as many Hawks as we do. Please sign up for my e-mail alerts and you will have each new article sent to you.